The ego says, "I shouldn't have to suffer," and that thought makes you suffer so much more. 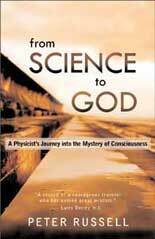 From Science to God is the story of Peter Russell's lifelong exploration into the nature of consciousness. Blending physics, psychology, and philosophy, he leads us to a new worldview in which consciousness is a fundamental quality of creation. He shows how all the ingredients for this worldview are in place; nothing new needs to be discovered. We have only to put the pieces together and explore the new picture of reality that emerges. Integrating a deep knowledge of science with his own experiences of meditation, Russell arrives at a universe similar to that described by many mystics -- one in which science and spirit no longer conflict. The bridge between them, he shows, is light. From Science to God invites us to cross that bridge to a radically different, and ultimately healing, view of ourselves and the universe -- one in which God takes on new meaning, and spiritual practice a deeper significance. DVD based on the book. Reality - an early on-line version of the book. Media Kit. Press Releases and other information in pdf format. Mysterious Light, a condensed version of the book that appeared in the Noetic Sciences Review. Consciousness: The Bridge Between Science and Spirit - Video of talk based on book.